I was looking out to try some chinese dishes which can be prepared with the sauces at are available in my refrigerator. One I thought of egg fried rice which you all are familiar with. And other dish which are actually looking was the side dish that goes well with fried rice. That was Kung Pao Shrimp. This dish is one of the best chinese appetite which has mix taste of sour, tangy with dash of sweetness and crunch of peanuts.This is such a dish, if all the ingredients are ready only in 5 minutes you can finish up this dish. This is one best combination meal hereafter I am going to try. So far machurian has always been remain as sidedish along with fried rice. So for the change try out Kung Pao Shrimp and enjoy your super meal. Finely chopped all the veggies and also scramble the eggs with tablespoon of oil into separate pan. And keep it aside. Heat oil in a wide pan or wok, add garlic and fry till its starts browning. Then add chopped and chopped white part of spring onions and fry till onions are soft. Then add carrots, beans and cabbage and sauté till they are tender not soft. Add all the chopped capsicum and sauté along with the veggies for 2minutes. Then add soya sauce and sauté it on high flame for 2minutes with continuous stir. Now add in chili sauce, pepper powder, and salt. Keep stirring for few minutes till the veggies are well blended with the sauces. Then add the cooked rice and mix well. Add scrambled eggs to fried rice along with green spring onions and give a stir until everything is well combined. Switch it off and serve hot. Mix all the ingredients ofKung Pao sauce and keep aside for later use. Heat the oil into the and add chopped garlic and stir well. Add onions, green capsicum and dried red chillies. Fry till you get spicy aroma from dried red chillies. Then add cleaned and deveined prawns or shrimps and roasted peanuts into the wok.Stir well till shrimps are half cooked. Add kung pao sauce and kep stirring until sauce thickens and the prawns are well cooked and blended into the sauce. Finally add chopped spring onion and give a quick stir. Switch off the flame. 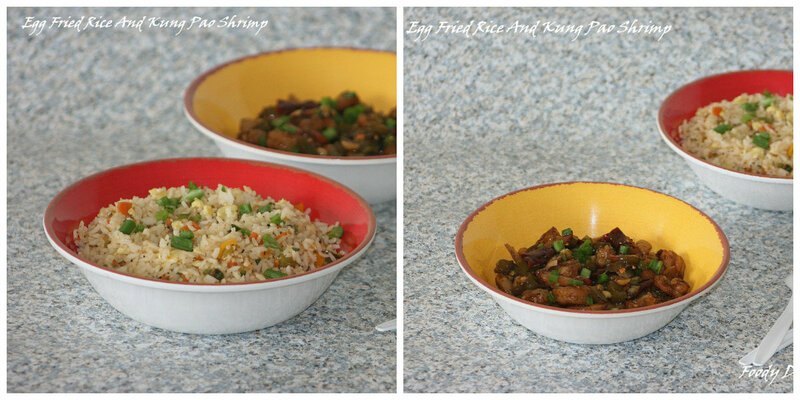 Who can resist to this beautiful bowls,inviting rice and droolworthy kung pao shrimp.